On May 26, 1976, during a special meeting, the students of ‘Interfaculteit Bedrijfskunde’ (Interfaculty Business Administration) discussed what they perceived as a lack of communication between students and staff, resulting in missed opportunities to express their vision for the future to the interfaculty administration. All were in agreement that an association should be established. During a meeting of the student representatives on September 16, 1976, an ad interim board was installed to create such an association. The ad interim board investigated already existing organisations and gathered ideas from staff, alumni, and students; plans were made. Because interfaculty staff were engaged in other affairs, the idea of a dynamic faculty policy was seen as impossible and undesirable. Therefore, the board decided to create an association purely for students, with a mission to “represent study- and students stakes of the students of the Interuniversity Interfaculty Business Administration”. The association was focused on three targets: external contacts, internal contacts with scientific staff, and, of course, mutual contacts. On March 21, 1977, the activities of the foundation were begun, resulting in a founding board composed of Gosse Jensma, Alexander Maas, Hans van Oort, Edu Massink, and Albert Dalmeijer. At the next meeting, the founding board was partly replaced by freshmen, resulting in the first official S.V.I.I.B. Board , beginning on May 2, 1977. The founding board’s first task was to sign the official Memorandum of Association on May 27, 1977. Subsequent boards raised the S.V.I.I.B. Association to higher levels. On June 23, 1986, these efforts were rewarded when the association was awarded A-status, the highest status the university can award to an active association. It was also the year the first Management Week was organised. In 1987, the first almanac was published, and the first International Business Study, as we know it today, was organised. The exact meaning of S.V.I.I.B. was lost in 1984, when the cooperative effort of various universities was dissolved and the faculty of Business Administration became an official part of Erasmus University. In 1994, the board decided to write the name as a proper noun, rather than an acronym, and later to remove the periods between the characters, so Sviib became the name, and it is widely recognised among the Business Administration population. In addition, several daughter associations (Dutch: disputen) were established. In random order, they are Markant for the Marketing Department, Impuls for Business Information Management students, Femus for those studying finance, Strategion for the strategy students, and so forth. BActive was founded in December 2000 by several students of the then-new programme in International Business Administration. At this point, the programme was part of both FBK and FEW; hence, it also initially involved cooperation between Sviib and the Economic Faculty Association Rotterdam (EFR). In September 2003, FEW pulled out and the programme continued under the name FBK. After paying a small sum to the EFR, BActive continued under the supervision of Sviib alone. 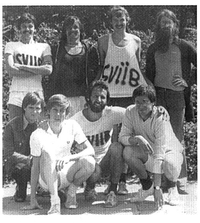 The aim of BActive was to offer activities in English, which neither Sviib nor EFR provided at that time, and to emphasise social activities. The reason for the latter was that many international students were not members of student associations and therefore looked to their study associations for social activities. As with the establishment of RSM Erasmus University as we know it today, which led to a more cohesive organisation of BA, IBA, and MBA studies, the aim was to achieve the same cooperation among study associations. During that time, BA and IBA studies were becoming more internationally focused. The traditional differences between the two groups, with Sviib focused on BA students and BActive on IBA students, were disappearing. 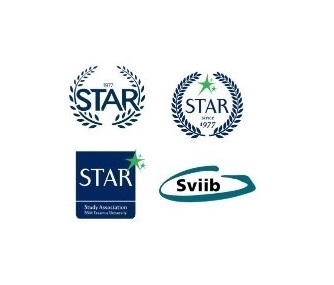 In early August 2005, Sviib and BActive merged into STAR, an association with a bit of both worlds and a more international focus. A new international name seemed to fit the new direction of the association best; officials decided not to renumber, but to assimilate the founding year of the old S.V.I.I.B. as a starting point. Since that time, activities have become more international and extensive. European Business Study has been completely replaced by International Business Study, Interface Magazine has grown from a photocopied A5 magazine to a professional full color A4 magazine, and Sviib (Management) Week, with its Sviib (Management) Week Party, has become a phenomenon. Over the past 30 years, STAR has become an association of influence, diversity, and professionalism. With more than 6,500 members, including 300 active members, we can proclaim to be the largest study association for business administration students in The Netherlands and in Europe. STAR’s Alumni are important to us. The Alumni association organizes several events throughout the year for our alumni.